One year from its launch at AC2014, we want to highlight an opportunity to publish reviews in Geo: Geography and Environment. Geo welcomes high quality review papers which provide theoretical, methodological and topical analysis for advanced researchers in the field, or offer critical perspectives that engage cross-disciplinary collaborations, explore policy implications and address issues of global concern (see guidelines for authors). We are especially interested in reviews exploring what it means to assemble communities of knowledge differently and making use of the opportunities for online, open access publication. We produce reviews in our PhDs, our grant proposals and our publications. To review is to assess and appraise. Reviews have a temporal element: looking back to assess and forward to propose change. A review is also a spatial practice: the review synthesises by defining and appraising a field. Yet, margins can be reinscribed and peripheries created in this process of producing knowledge. Situated epistemological differences may get recast as conceptual or methodological ‘problems’ to be solved by further integration with the theoretical core. There can be good reasons for an emphasis on consensus or periods of normal science. However, postcolonial, feminist and geopolitical critiques attune us to the active processes through which knowledge practices are made marginal and the implications of overly dominant scientific cultures. New practices of review have the potential to make these geographies of knowledge production more visible and so create the conditions for a different circulation and assemblage of ideas. Innovations across the social and natural sciences, arts and humanities are advancing alternative resources for constructing and disseminating reviews. From the sciences: systematic reviews demonstrate how criteria for inclusion and exclusion can be made more explicit and accountable; large-scale data sets offer opportunities for developing and tracking the back-and-forth of new modes of co-operation; network analysis software can map evolving patterns of inter-citations and the relational transformation of their content. These have not featured widely in geographical reviews, but used reflexively, they have potential across the social and natural sciences. From the digital arts and humanities there are promising experiments in developing online platforms to support collaborative working and review; innovative visualisations of data, concepts and relations; and alternative forms and frames for data mining that value difference in previously unseen data. Geo: Geography and Environment has space for review and we want to encourage reflection on these spaces of review. We welcome your conversations and all submissions, especially those mapping the ways in which communities of knowledge emerge and creating innovative, interdisciplinary and inclusionary spaces through review. Our paper, The internal structure of Greater London: a comparison of national and regional geodemographic models, recently published in Geo, explores the geography of where we live to identify 19 distinctive “tribes” that characterise London neighbourhoods. This London Output Area Classification (LOAC) was created in collaboration with the Greater London Authority. We employ an area classification technique referred to as geodemographics, which are a set of methods that were initially developed in the 1970s (with a model of Liverpool) by Richard Webber. Further details are given our paper, however, in brief, geodemographics are created using a computational technique that compares multiple attributes of areas (e.g demographics, employment, built structures etc.) and places them within clusters aiming to maximise similarity. These are then summarised with names and descriptions. Within the UK, the Output Area Classification (OAC) is an example geodemographic classification, and was created on behalf of the Office for National Statistics from census data. A classification exists for both 2001 and 2011, and both were built with an entirely open methodology. However, one criticism of national classifications such as OAC is that they do not adequately accommodate local or regional structures that diverge from national patterns, which is an acute issue for London. This can be illustrated with maps of the 2011 OAC for London and the much smaller city of Liverpool. The problem with the national classification in context of London is evident from these images, with the majority of London classified into 3 clusters. 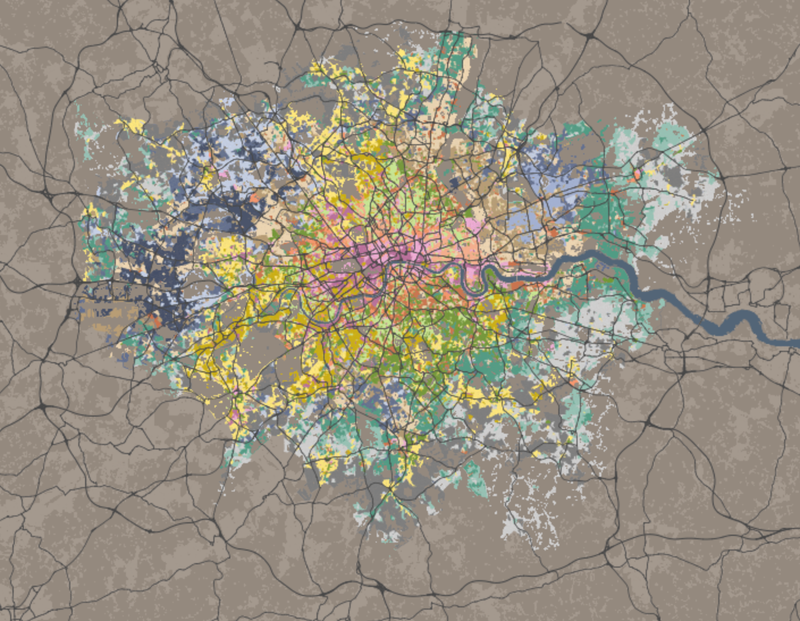 However, the London classification presents a much more variegated picture of London. The best way to view the classification is on the website: or you can search for your postcode – you can even let us know if you think we got your neighbourhood wrong! Singleton, A. D., and Longley, P. (2015) The internal structure of Greater London: a comparison of national and regional geodemographic models. Geo: Geography and Environment, doi: 10.1002/geo2.7. In addition to the first UK geodemographics being created for Liverpool by Richard Webber (also a graduate of the University of Liverpool); and this paper a University of Liverpool / UCL collaboration; one of the earliest examples of area classification within the context of London includes the maps of Charles Booth created between 1889-1903 . Charles booth was a Liverpudlian philanthropist. His maps were created through direct observations, and partitioned London into a series of summarising groups which are available to view online. Singleton, A. and Spielman, S. (2013). The Past, Present and Future of Geodemographic Research in the United States and United Kingdom. Professional Geographer, 66(4), 558-567. Reflexion: Does the logic of the University sector allow space for Open Science? A response to Leonelli et al. How does a researcher gain legitimacy? Within the UK context legitimacy is increasingly informed by the 6-yearly Research Excellence Framework (REF) exercise, which drives departmental funding. Researchers must demonstrate entrepreneurial innovativeness, international relevance, and situate the wider relevance of their research against a shifting definition of ‘impact’, as well as being able to demonstrate the ability to attract and maintain a satisfied student body. In a hyper-competitive academic market, such neoliberal codes of success are increasingly important. The Open Access issue must be considered within this context. The fields of historical- and palaeoclimatology (my own disciplines) have made large strides towards the kind of open access described in the paper by Sabina Leonelli and colleagues, recently published in Geo (Leonelli et al, 2015). Web-portals such as the National Climatic Data Center provide a repository for the results of published climate reconstructions. Further moves are being made towards the establishment of repositories of raw data, particularly narrative information from sources such as diaries, personal correspondence and government reports. Such descriptions of meteorological variability and climate-related phenomena and activities can be used for both quantitative reconstructions of climate in the past and for a multitude of perspectives on human-environment relationships. The ongoing ACRE (Atmospheric Circulation Reconstructions over the Earth) project, run from the UK Met Office, are envisaging a dynamical global 4-dimensional database of historical weather that incorporates data from state-of-the-art reanalysis through to cultural interpretations of climate. This is in addition to existing databases such as Euro-Climhist and the tambora.org archive (the climate and environmental history collaborative research environment). Such approaches are important for encouraging the cross-disciplinary work that is increasingly recognised as necessary within the field of climate change research (Hulme 2011). Online repositories also allow for a public ownership of climate data, an endeavour that can be at times frustrating, given the ways that climate data are used by some elements for personal attacks on climate scientists. This is not to say that such endeavours are imprudent. The sharing of climate data should ultimately break down, rather than reinforce disagreements. Citizen science projects such as Old Weather (oldweather.org) take public ownership even further, with non-academics actively involved in the data management process. Such ownership, however, can only really be partial. The institutional culture outlined above creates huge pressure to analyse, interpret and publish before any data is shared. Departments, competing for ‘world class’ research outputs, are reluctant to relinquish ownership of data before outputs are be generated. The goal of ‘research for all’, as witnessed from outside the academy, is at odds with this individualised logic within. This is a long way from Science 2.0, at least within geography. To reach the point where science can be undertaken in collaboration with any interested parties would require a paradigm shift in the way that Universities are run and what is prioritised, something which could have been given more emphasis in the paper (Leonelli et al, 2015). The ongoing implications of the 2012 European Commission Recommendation (EC 2012), which recommends a fundamental change in the way academic careers are evaluated to include data-sharing, will therefore be interesting to follow. Such a cultural shift would not be unwelcome. Dr George Adamson is Lecturer in Geography at King’s College London. George’s research is situated at the interface between palaeoclimatology, environmental history and climate change adaptation and policy. Leonelli, S. et al. (2015) Sticks and Carrots: Encouraging Open Science at its source. Geo: Geography and Environment, doi: 10.1002/geo2.2. Launching a new online open access journal with the RGS-IBG and Wiley has been an exciting and interesting process. It has also, at times, raised some unexpected issues. Not least, what does it mean to launch an online journal that, as yet, has no content? How best to share the news that we are now open – really open – as well as signal the content we are hoping to publish? The opening editorial has been a key part of this early exchange. This sets out what we want the journal to achieve with research papers, agenda-setting review essays, and innovative data papers, which advance opportunities for interdisciplinary, online and open exchange. We are also delighted to be sponsoring the following sessions at the Royal Geographical Society (with IBG) Annual International Conference 2014. We have been inspired by their commitments to collaboration, their conceptual inventiveness, their interest in digital and visual methods, and their desire to push the boundaries of academic exchange in productive ways. This is very much in the spirit of what we want Geo to publish and promote. We would like to thank the organisers of these sessions, and the contributors to them, for joining us in widening awareness of the launch of Geo. We hope to attend many of these sessions and contribute to the exciting conversations around them. The conference will be also be an occasion for attendees to meet the editors and publishers of Geo, ask questions and explore opportunities for submission. The Wiley stand will be open during conference hours and we will be joining them on Wednesday morning. We are happy to answer your questions about our activities, at any time, during the conference, and of course by email after. Finally, no journal launch would be complete without the sponsored conference drinks. We are delighted to invite you all to the opening drinks on Tuesday 26 August, at about 19.45, after the Chair’s Opening Panel on Co-Producing Public Geographies. We look forward to celebrating the journal launch later this month and to continue working with you on generating the content that will realise the journal’s aspirations into the future.